G-E-O-R-G-I-A! : Blog Of The Nation Sports Illustrated ranks the Georgia Bulldogs #1 in the preseason, but now is not the time to crow about future national titles... I'm just here to enjoy the now. Olympics, schmolympics. Nah, I'm kidding -- I like the Olympics as much as the next sports fan (and especially loved the Olympics challenge on Project Runway last night, did you see it? No spoilers on the winner here, but it was a great challenge. The opening ceremony of the Olympics is one of my favorite fashion events, and it was great to call some attention to that particular parade.) BUT have you seen who is on the cover of the new Sports Illustrated? 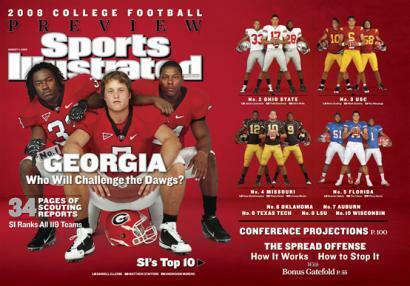 I can barely speak about it... it's my beloved Georgia Bulldogs, pre-season #1! It's terrifying -- for sure. If we get the cover, we're cursed, right? So I'm not placing a lot of stock in the prediction (and if you've seen the Dawgs' schedule, you know why), just enjoying it for what it is. And here's something for you to enjoy: Knowshon Moreno, star running back, had a little run-in with the University of Georgia Conduct Review Board for violating quiet hours in his dorm. The Board sentenced him to write a "two-page research paper about the harmful effects of excessive noise pollution on the health and lifestyles of others around you." Sounds pretty mundane, right? Not so. 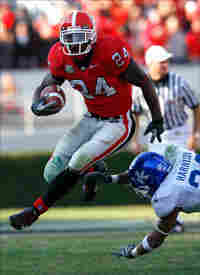 How does Knowshon demonstrate he learned his lesson? To show the responsibility that I have gained over this situation I was recently asked in my room one night after quiet hours if I could do a back flip. My answer to this was yes because I can, but I kindly stated that I would not be able to perform this act at the time because I did not want to disturb my fellow neighbors. Awesomeness. Click here to read the full essay by the best running back in the NCAA, Knowshon Moreno.